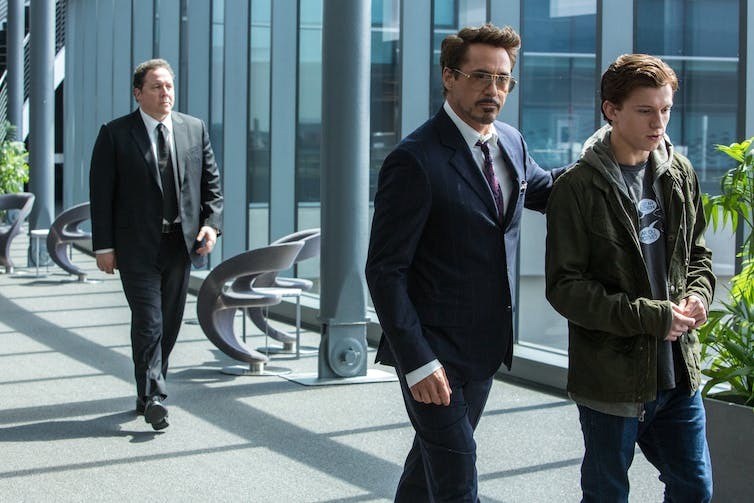 Spider-Man: Homecoming is the second modern reboot of the Spider-Man film franchise, with the young Tom Holland following in the footsteps of Tobey Maguire and Andrew Garfield. That’s three different film series in a 15-year period! 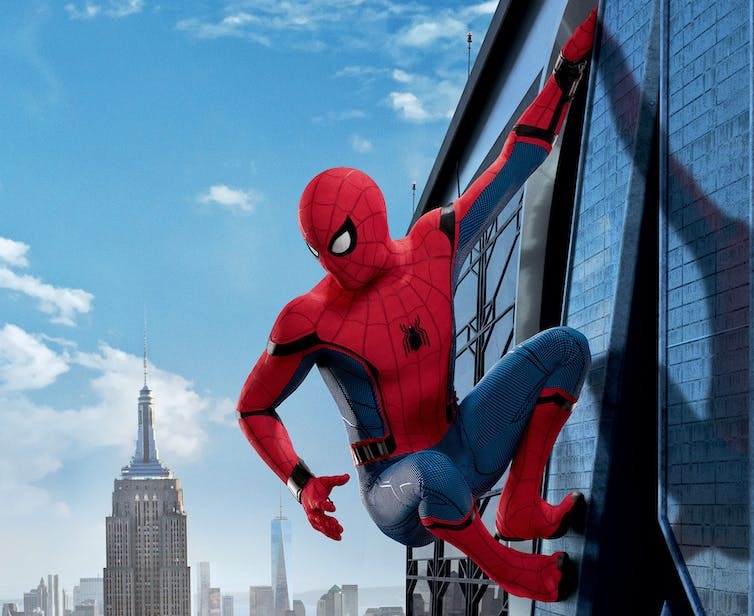 The movie takes a relative step back in scale from the universe-destroying plot elements of recent Marvel films, concentrating on a young Peter Parker’s struggle to balance school and being Spider-Man. Vulture is a more human villain. Columbia Pictures/Marvel Studios/Sony Pictures. The film is great - a very funny, teenage-focused take on Spider-Man. 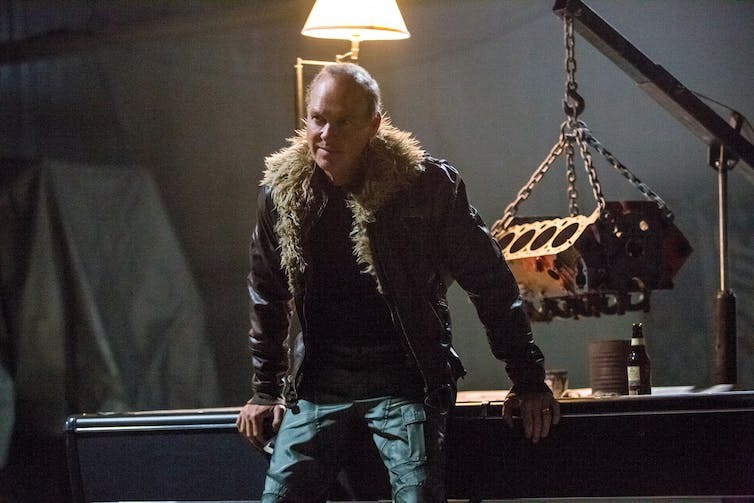 It also benefits from a more human, more interesting villain than recent Marvel films, in the form of Michael Keaton who plays Vulture. Spiderman moves through the city effortlessly (mostly) by shooting his web out to attach onto high points and swinging repeatedly. 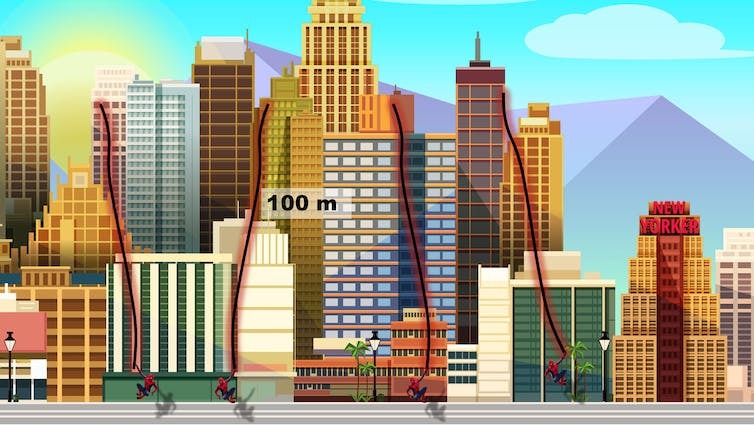 If we assume that the web is itself not powered (more like an unpowered projectile; a bullet rather than a rocket), we can calculate the initial shooting velocity required to reach the tops of buildings with his shots. That’s not very fast - a bullet from a .22 rifle exits the gun at a speed of about 300 m/s. However, if air resistance was taken into account, it’s likely that the web firing speed would need to be significantly higher. Verdict: Plausible, given the apparent speed of the web shots on screen. Most people have heard the common sayings about spider web being “stronger than steel”, even though that’s a myth. 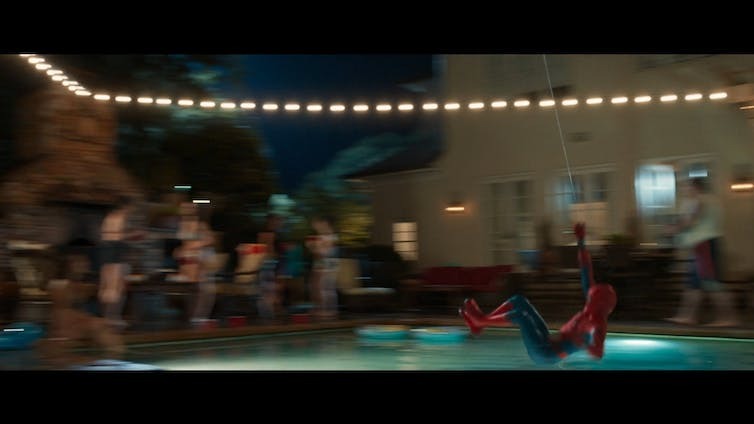 On screen, it looks like Spider-Man swings around on a pretty thin bundle of web. Is this realistic (assuming his web is like a normal spider’s web, not some Marvel universe “super” web)? Spider web has a tensile strength of about 1,000 Megapascals (MPa). This means it can support 109 Newtons per square metre - 1 billion Newtons is the force required to hold a 100,000 tonne weight. The square metre refers to the cross-sectional area of the web. That could support a static weight of about 720 kilograms (divide by gravity = 9.81 m/s/s). Now when spider-man jumps off a building and falls, he exerts a dynamic loading on the web, increasing his effective weight from say 60 kg by several times. Even so, carrying his own weight is plausible. Verdict: Plausible for his own mode of personal transportation. During a fight between Vulture and Spider-Man, a malfunctioning Chitauri gun slices the Staten Island ferry in half, threatening to drown the passengers. Spider-Man intervenes with his web, endeavouring to hold the two halves of the ship together. Doing the calculation properly for the forces involved in holding a ship together like this would be very complex and involve modelling the interaction of the ship with the water. We can do an approximation by ignoring any supportive force from the water, and considering the moment at which the ship is cut in half (before the two halves tilt outwards much). A Staten Island ferry can weigh around 3,200 tonnes. Each half will feel a gravity force of 9.81 * 3,200,000 = 31,392,000 N.
The ferry is 21 metres wide, so each half is 10.5 metres wide. If we assume the ferry is a homogenous mass, then each gravity force will act at a distance halfway out from the centreline: 0.5 * 10.5 = 5.25 metres out from the centreline. The web would be under a total tensile force from these forces combined - so about 31,392,000 N.
Verdict: It’s a nice touch that they show him targeting the strong points of the ship structure for his web reinforcement. Even with that, he was in big trouble though - so it’s pretty realistic that Ironman had to come save him and the ship. Spider-Man: Homecoming is great blockbuster entertainment, as fun as the Guardian of the Galaxy movies in a more family-friendly way. It’s regularly very funny, while managing to not veer into trying too hard. Tom Holland is fantastic as Peter Parker / Spider-Man and says he will continue with the role, which is great news for fans. In terms of the science, the film does pretty well. Within the “rules” of the MCU universe, most of the big scenes are plausible. There’s even a nice touch in a classroom scene, when Peter is quizzed by his science teacher on the formula for angular acceleration of a pendulum. Peter’s answer of angular acceleration = gravity * sin(theta) is both correct and also a sly reference to Spider-Man’s frequent mode of transport - swinging through the city streets on a web “pendulum”. So - entertaining and accurate: we hope that the new Spider-Man sticks around for a while yet. Stunning peacock spiders with their gaudy mating displays have become internet darlings. We chat to the man behind the photos. Hairy feet help hefty spiders climb walls with the aid of van der Waals force.